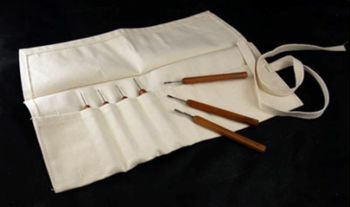 Canvas Toolholder for Dockyard Tools 12 slots 15 x 10 inch. This tool roll will hold 12 of your favorite Dockyard tools or any other tools that have a 3/8" handle. There is a protective flap that goes over the tools so they can't slip out after you roll it up and tie it off.